GSC Game World is considering always-on DRM for S.T.A.L.K.E.R. 2. The S.T.A.L.K.E.R. series is one of the most distinctly PC game franchises in existence. It's deeply weird, punishingly difficult, buggy, quirky and, for those who see that sort of thing as "character," one of the most intense and memorable shooter experiences of all time. But now it seems that Ukrainian studio GSC Game World is thinking about implementing another, far less welcome PC-centric feature: always-on DRM. "Part of the content will be located on the server and downloaded as the game progresses," Studio Director Sergey Grigorovich told Ukrainian site KP.ua [via Kotaku Australia]. "Permanent internet access is required. Text information, code and quests will be loaded through that connection." Combine the inherent issues with always-on DRM [hello, Ubisoft] with the notoriously twitchy S.T.A.L.K.E.R. and you can imagine how well this idea went over with a good many fans. That led to a quick semi-about-face from GSC, which clarified on Twitter that the DRM plan is a "possibility, not a choice." "The idea of implementing DRM came in as a possible anti-piracy solution," a rep explained to Rock, Paper, Shotgun. "You know the severe level of commercial piracy we have here in ex-USSR region. This said however, there is no firm decision to go for DRM with S.T.A.L.K.E.R. 2 as of now. Be assured, we do realize how uncomfortable this solution is for the players, so we'll continue looking for most effective, yet acceptable for all, way of protecting the game by the time of its release." The new S.T.A.L.K.E.R. 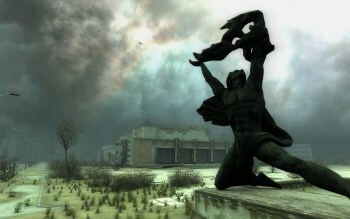 is actually being developed for consoles as well as PC and is expected to come out sometime in 2012. Here's hoping GSC comes up with a better idea by then.